Hello everyone! 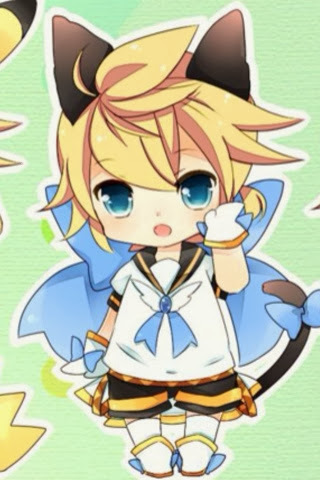 This is the first of a series of tutorials for this specific Len cosplay. :) For all of the tutorials I will be using the same reference pic for all six tutorials. :) I know, it's a lot of tutorials but I'm up for the challenge! :D This tutorial will be so super duper simple that I'm not sure if I should put up a tutorial for it. STEP 3: Take your gloves and make sure that they fit your hands. Then take the flexible measuring tape and measure the circumference of the bottom of the glove. STEP 4: Take the circumference of the glove bottom (this is your width) and 1 inch (this is your height) and make your pattern. Cut out your pattern and pin it to your folded yellow fabric. Cut out the pattern of fabric and you should end up with two copies of the paper pattern in yellow fabric. STEP 5: Take your strips of fabric and pin them to your gloves in a "hemmed" fashion. Now sew them. STEP 6: When you're done sewing the yellow boarders onto the gloves take your ribbon and cut a foot or so. Then take the ribbon and tie it into a neat bow. Repeat for the other bow. STEP 7: When both of your bows are tied, heat up your hot glue gun and hot glue the bows to your gloves. OPTIONAL: If you don't want to glue the bows to the gloves then take some velcro and hot glue the hook part to the backs of the bows and the fuzzy parts to the gloves. You can also sew the velcro to the gloves and bows. Then you'll be able to remove the bows whenever you want to use the gloves for something else. Thank you to everyone that has visited my tiny blog. :) It grows every time someone views a post or follows me. :) Yep, so I will see how long it takes me to get the tutorial vid out, so please be patient with me. My computer access is limited for some things (aka I can't get onto YouTube from my home computer. D:< ).